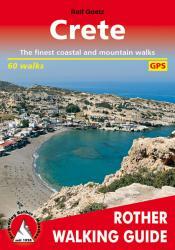 Rolf Goetz, a seasoned writer of walking guides for the Bergverlag Rother, presents 60 walks on the island of Crete, all rich in diversity. Each individual walk includes a short preface with all the important key points, an exact description of the route, a pertinent height profile and a little walking map with the route marked in. Apart from these, there are many tips pertaining to the availability of refreshment, possible alternative routes as well as sites worth a visit. GPS tracks are available for downloading. Numerous delightful photos whet the appetite for making the island your first choice for your next holiday sojourn. Road map of Cyprus with street plans of six main cities, plans of archeological sites and, on the reverse, notes on the country's history and brief descriptions of main places of interest. All place names are also given in the Greek alphabet, except in Northern Cyprus, where most names are in Latin alphabet only but with their Turkish alternatives. The map emphasizes main roads, but also includes unpaved roads and cart tracks. Intermediate driving distances are shown on main routes. Symbols highlight various places of interest, including campsites and mountain refuges, archaeological sites, churches, monasteries and mosques, golf courses, caves, etc. The boundary between the two parts of the island and of the British base at Akrotiri is marked. Relief shading with occasional spot height gives some indication of the topography. The map has no geographical coordinates or an index. Also included are insets showing main streets in the central parts of Nicosia, Famagusta, Kyrenia, Larnaca, Limassol and Pafos. Plans are provided for the archaeological sites at Kourion, Salamis and Saranda Kolones. On the reverse are notes on the island's history and brief descriptions of several places of interest. Mediterranean Cruises map from Freytag and Berndt, showing the whole of the Mediterranean Sea plus the south-western part of the Black Sea at 1:2,000,000 on a large double-sided sheet. Main ports are highlighted and car ferry routes are marked. The region is divided east/west, with southern Italy and Sicily included on both sides. An inset provides coverage of the Ukrainian coast of the Black Sea with most of Crimea. Perhaps somewhat incorrectly titled, the map does not aim to highlight locations visited by the Mediterranean cruises, but rather shows the network of roads and main railway lines across the regions bordering the Mediterranean and the south-western part of the Black Sea. Also shown are main airports and numerous car ferry routes. International and within most countries internal administrative boundaries are marked. Topography is indicated by relief shading, with spot heights and names of mountain ranges, etc. Latitude and longitude lines are drawn at 1 intervals. The map has no index. Multilingual map legend includes English. Illustrated visitor's map of the Mediterranean including the Black Sea. Scale 1:4,700,000. Includes enlargements of the Adriatic and Aegean Seas (scale 1:2,750,000). Features Gazetteer with brief descriptions of 240 of the region's cities, towns, visitor attractions and archaeological sites. Includes historical timeline from 2550 BC to AD 1974. Features Pantheon of the Gods of Olympus, with their responsibilities. Wondering what to read when visiting the Mediterranean Region?